SMD Dome Switch is a type of new metal dome package which designed to be soldered on PCB/FPC/MCPCB, or any other circuits, by directly SMT/SMD reflow soldering technology. The circuit board for soldering is on the bottom of each dome, and on top of metal dome, there's a layer of yellowish Polyimide with a Plunger & Actuator in center area, to seal the dome and add the clicking feeling. 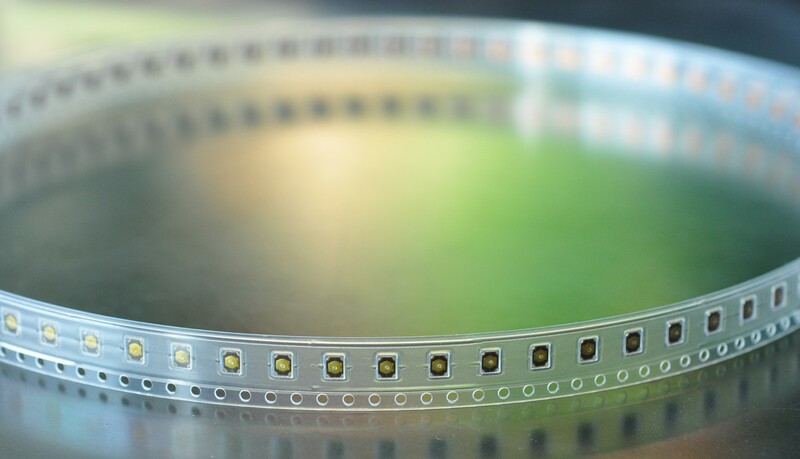 Each of SMD dome switch is in a socket on a continued tape and packed on a reel, so it can be picked and place like normal components such as resistor, capitor, on SMT machine, similar like our"Tape & Reel Metal Dome ". But the difference, and major character for this SMD dome is: It can be soldered directly on any circuit like any other SMD components! Normal dome is not suitable for soldering. Used for Low profile and Lightweight design. Size is very small, such as 3.4mm*3.0mmx0.7mm for "SI-C3430A-7015". Applicable for Various devices such as cell phone, MP3, Camera, Audio, Video and Communication devices, etc.